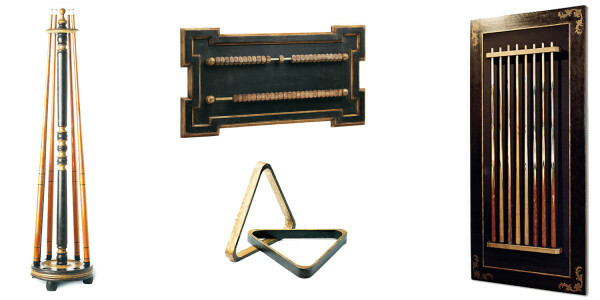 The Centenario is a fine tables in the “Classic Collection” . it has been inspired by the classic models found in the aristocratic European country houses and castles of the 18th century, the time when billiards was the favorite sport of the moneyed elite. Tables in the classic collection are ideally designed for House of Distinction and have become the choice of top interior designers across the world looking for products that are both aesthetically pleasing and built from the finest of materials. 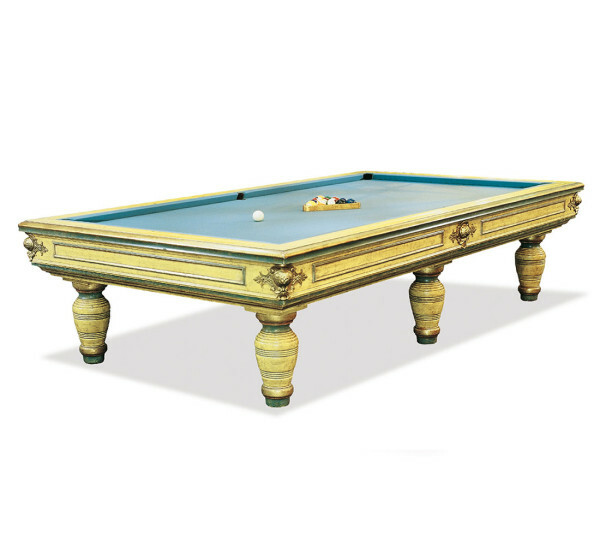 The Centenario is shown in a handmade decorated aged yellow, light blue & gold finish that gives this specific table a unique color, tone and texture. 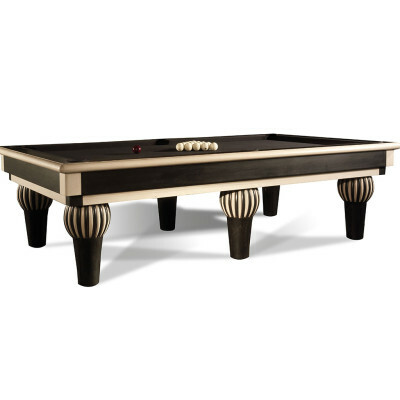 It is a striking contrast to the run-of-the-mill billiard table and gives a look richly suggestive of bygone eras. The “decorated” finish is hand painted by Italian artists who use techniques learned over the centuries. There are many steps and many man hours of artistic work to apply layer after layer of color, 24 karat gold or silver leaf, and the artistic removal of color. 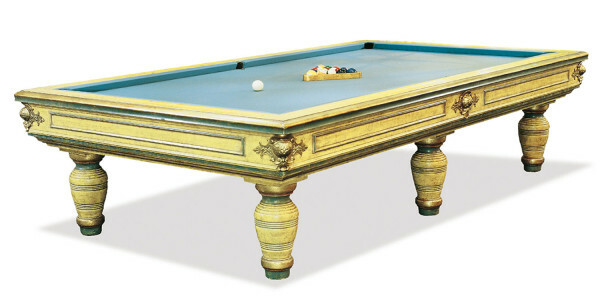 The end result is each piece becomes a unique work of art and object of fascination even to those who have no interest whatsoever in the game of billiards. The “decorated” finish can be artistically applied in any imaginable color or combination of colors, with or without gold and silver leafing. The possibilities are endless. We can meet the most exacting demands of color and texture to coordinated with existing design schemes. The play surface is constructed from the finest Italian slate precisely honed to 10,000th of centimeter and a full 5 cm (2″) thick not including the wood framing. Option: Each model belonging the the collection can have a particular finish. Standard finish is natural wood varnished. Options can be: decorated patina, hand scratched for a weathered look, Moka wax finish, lacquered in any color, upholstered in Velvet or in Leather. 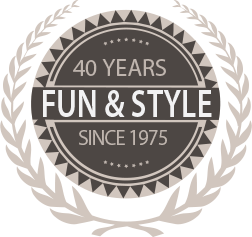 The complete handiwork of the manufacturing process allows intervention in each phase of the construction, modifying at pleasure each detail that is not involved in the dynamics of the game. 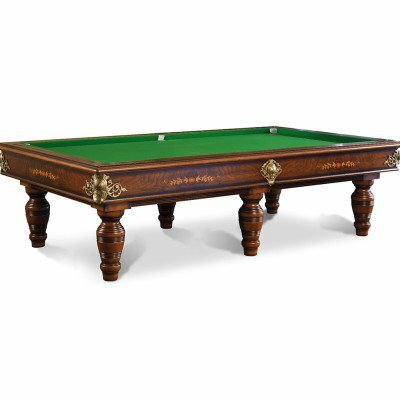 Each table comes standard with matching wall or floor cue rack, wooden scorer, triangle, Belgium Super Pro aramith balls, four 2-piece cue sticks, the finest Gorina, Iwan Simonis or Hainsworth worsted fabric in many fabulous colors.